Jacopo Robusti, known as Tintoretto, was born in Venice in 1519, and according to tradition, after an extremely brief (only a few days, it is said) apprenticeship in Titian’s workshop, was already by the age of twenty established as an independent master. Titian’s work was undoubtedly important for his training, but equally the influence of other Venetian painters, together with promptings derived from the nascent mannerist culture and an absorption in Michelangelo’s sculptural work, were crucial to the formation of his painterly language, characterised by rapid brushstrokes, a supple rendering of the human figure and strong chiaroscuro effects. 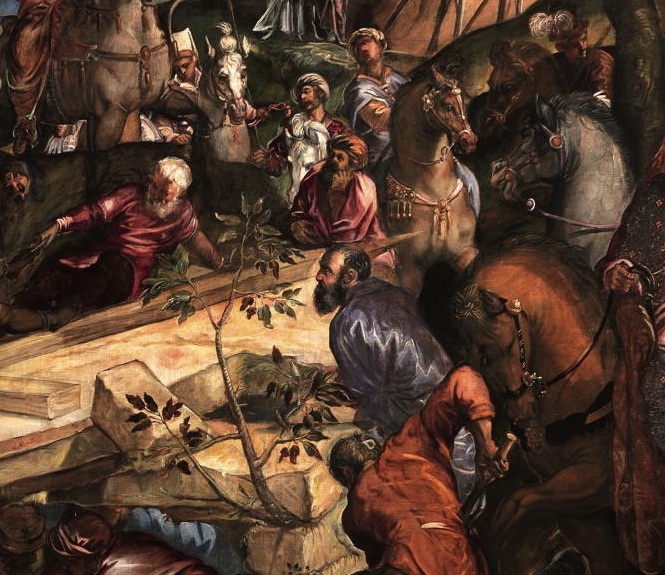 Before becoming indissolubly linked with the Scuola di San Rocco, where he worked for over twenty years (1564-c1588), Tintoretto had already made his name with a series of masterworks, among them the marvellous St Roch Healing the Plague-Stricken for the adjacent church dedicated to that saint. But it is particularly the interaction between the unforgettable canvases – more than sixty, featuring episodes from the Old and the New Testaments – and the Scuola Grande di San Rocco that makes their pairing extraordinary to the point that one cannot call to mind the Scuola without associating it with the poetic impact of these masterpieces. Some critics have gone so far as to suggest that this pairing is Venice’s equivalent to Rome’s Michelangelo and the Sistine Chapel.